Perhaps the posts about vintage yokes from Kate or Ella finally got to me, or perhaps it was just the siren song of the bright, bright teal, but I found myself impulse-buying this beautiful Norwegian yoke last weekend when I spotted it on the sidewalk rack of a local vintage shop. While the fit is a bit... let's say dated, and the sleeves are short (they're always short on me if I haven't made it myself), I really don't mind since the yoke is so striking and it'll be warm in the winter nonetheless. It's knit by hand, bearing the label "Maurtua," which was actually a handicrafts shop in Oslo that catered almost exclusively to tourists (which is probably how it made its way from Norway to Seattle). The address, Fridtjof Nansens Plass 9, is located in the semicircular plaza surrounding Oslo's city hall, and that storefront is actually still a souvenir shop today (though the current shop goes by the far more generic name of "Norway Shop"). At any rate, I got curious about the pattern, which bears a notable resemblance to Unn Søiland Dale's famous "Eskimo" sweater. Those of you who have read Kate Davie's Yokes will recognize it from the chapter, "Greenlanders and Norwegians." If you don't have the book, Kate talks a bit about the sweater about halfway through this blog post. A quick Google image search for "Martua Husflid" shows that Maurtua definitely made use of Husfliden 419, different iterations of which can be spotted on the image search page. 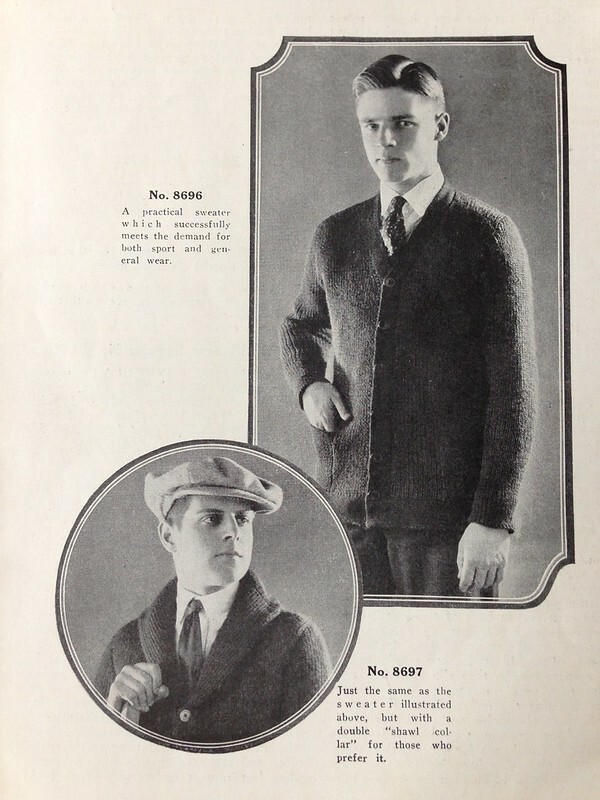 While it's possible a pullover version of the pattern existed too, my best guess is that the knitter who made this sweater decided to make use of artistic license and modify the pattern. I must say I'm in favor of the design choices - the design looks great as a pullover rather than a cardigan, and the use of two different teal-blues gives the yoke a lovely depth that Norwegian knitting doesn't always achieve with its typically limited color palette (the same goes for the combination of light grey in addition to the main off-white color). The red is a sort of rusty brick red, less saturated than a candy apple red would be, which helps balance the yoke and keep the bright design from being too overwhelming. There are some chart differences as well, where the knitter appears to have embellished or modified existing motifs. The stripes at the ends of the ribbing at neck, cuffs, and hem are a nice touch. I love too how the stranded motif at the sleeve cuff echoes the motifs in the yoke without actually replicating them. I'm quite pleased with my new pullover - I love digging into the history and trying to track down the origins of a piece of knitting. Do you have any vintage favorites or hand-me-downs that bring you inspiration? P.S. A very hearty thank you to all of your kind words about my Norway/grad school news. I am so excited to make this leap and your support and encouragement means the world to me. I've had a lot of people express hopes that I'll be writing about my adventure, and I'm absolutely planning to do that! Something to look forward to. 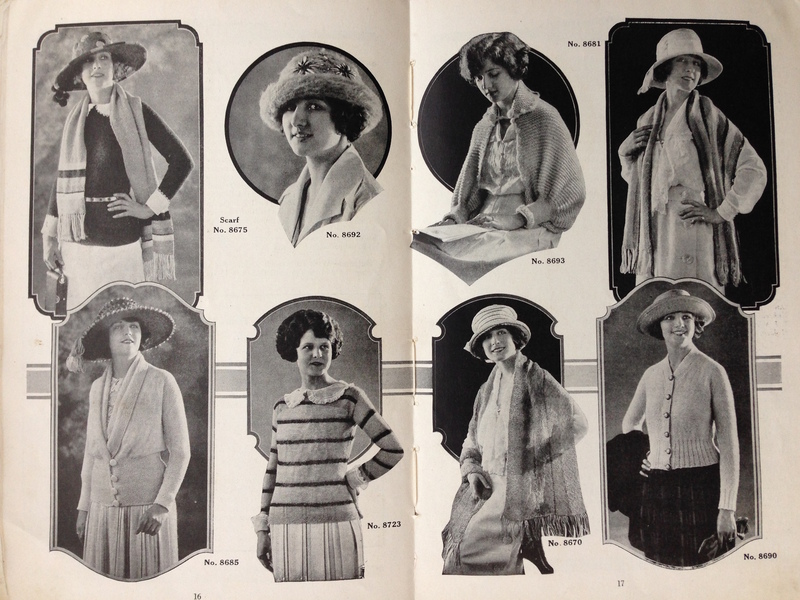 I enjoyed Karen's post that went up today over at Fringe about the vintage sweater booklets sent to her by a friend. I had to smile to myself, because yesterday I'd pulled out what is probably my oldest piece of knitting paraphernalia - and I was largely inspired to do that because of the waistcoat Karen's currently knitting from a vintage pattern. 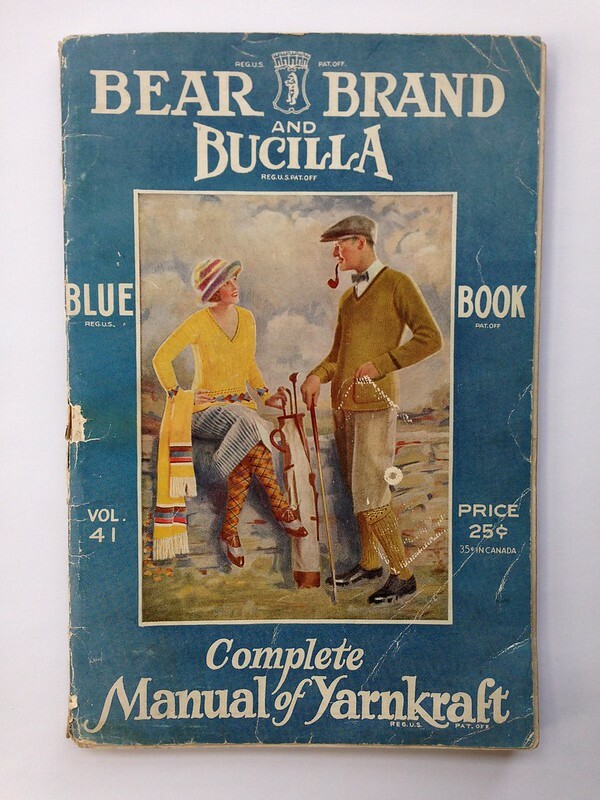 The booklet I pulled out to look at again was published Bear Brand & Bucilla in 1922 - it belonged to my great grandmother, who taught my mother to knit, and was passed down to me by my mother, who thought I'd enjoy it (and she was right). Like the Jack Frost booklets Karen wrote about, the booklet's near falling apart (in fact, the cover is completely detached) and there's ancient yellowed tape holding together pages that were torn long ago. I don't know much about Bear Brand or Bucilla yarns, but apparently they were both under the umbrella of the Bernhard Ulmann Co. As you can see, my booklet is volume 41. I love that this was early enough they were spelling it "yarnkraft" (cursory Google searches seem to indicate that this later became "yarncraft," as we would now expect). How contemporary is that beautiful striped pullover? I adore it. Knitters of the twenties would appreciate my current obsession with garter stitch, I think. 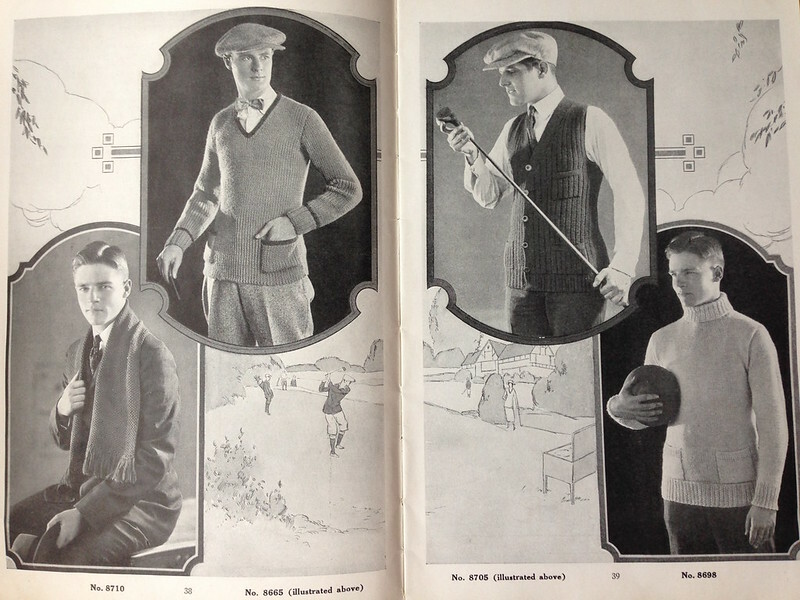 "A practical sweater which successfully meets the demand for both sport and general wear," with optional shawl collar version. Practical indeed. 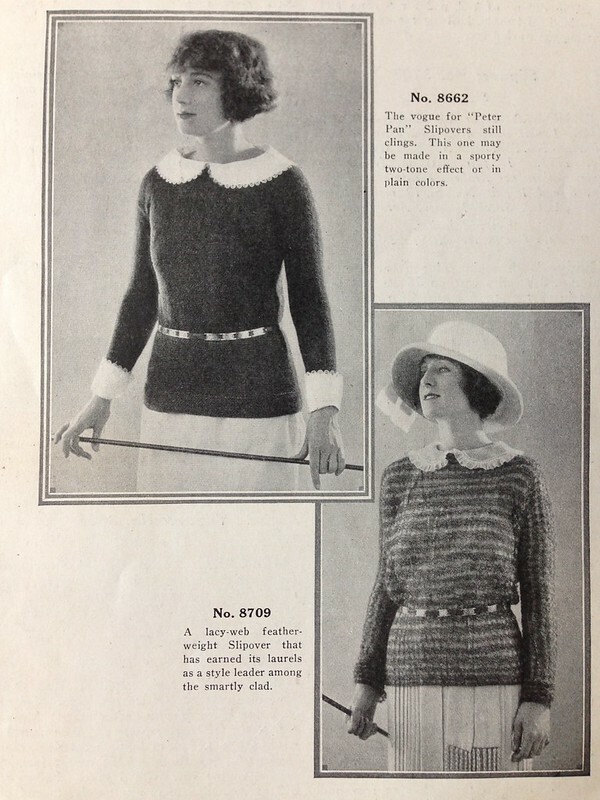 I've never actually knit from a vintage pattern but I'd love to someday, regardless of the challenges they present for the modern knitter (how to substitute yarns, how to make sense of terminology and abbreviations that may have changed over the decades, how to achieve the right size, etc.). 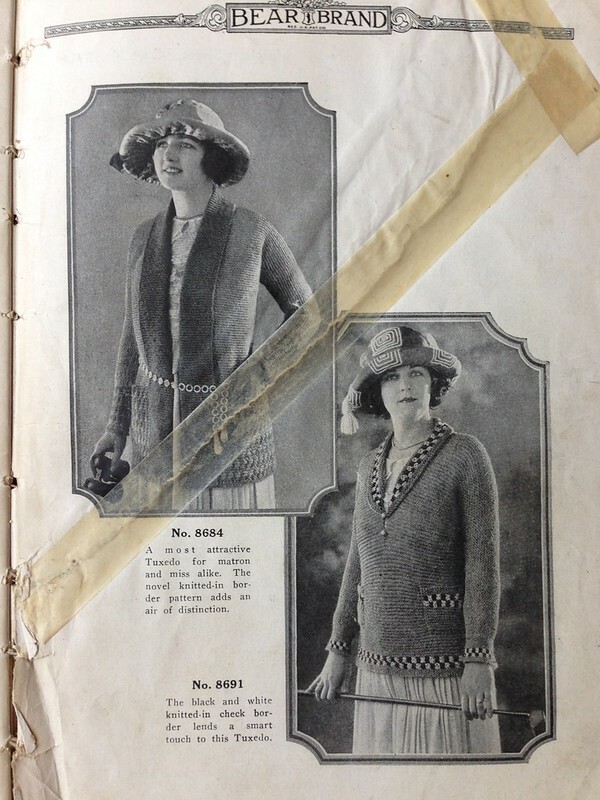 I'm definitely looking forward to seeing Karen's finished waistcoat, and I'd love to see any projects you all might have knit or crocheted using vintage patterns.